Sometime in the last two years, the donut eclipsed the cupcake in popularity. I'm not sure how it happened, but it seemed like overnight every NYC cupcake shop was replaced by a donut shop. I'm not mad about it. With so many delightful new donut options, it can be hard choosing deciding where you want to consume your calories. I'm here to help. I first discovered the addictiveness of Dough donuts a few years ago at Smorgasburg. Now they can be found in pretty much every indie coffee shop in NYC. Personally, I still think they're at their best when purchased from the original Bed-Stuy location. Fair warning -- these are pretty light, so you're going to want a bunch. I used to consume these a lot more when my friend, Cat lived around the corner from the shop. These donuts are dense, greasy, and damn delicious. It's always crowded and they run out early (like 8 a.m. early), so be sure to get there first thing! My friends are split into either Dough people or Doughnut Plant people. Can't we all just get along? To be fair, if you're looking for a denser and cakier donut, you won't find it at Dough. Doughnut Plant's pastries are a full meal unto themselves, so prepare yourself. Are you looking for more of a snack than a meal? Then this is the place for you. 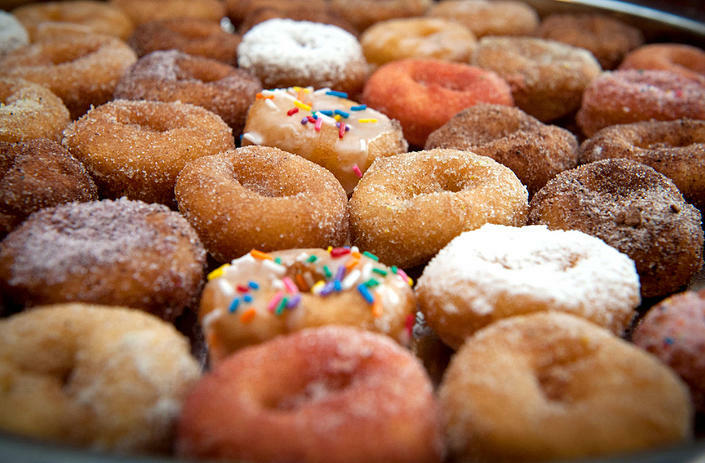 These mini donuts are bite-sized heaven. Since they're so small, I recommend a sampling of various flavors. One day my coworker, Maggie brought these delicious donuts into work (and into my life). Now I'm hooked. They're similar to Dough in texture but their flavor profiles are a bit stronger. Favorite Flavor: Currently they have a limited edition chicken & waffle donut. Get it while its hot!